What’s Ireland's cuisine like in a nutshell? Ireland has a tradition of great substantial winter food - stews, boiled bacon and cabbage, potatoes served a dozen different ways. Those dishes are still to be had in every pub and many restaurants, but there's also been a huge amount of culinary diversification over the last decade or so. Restaurants in Dublin range from the Michelin-starred, combining traditional French cuisine with Ireland's excellent natural produce, to holes-in-the-wall serving vodka and Polish sausage till 2 am and plastic-tabled Asian canteens with Szechuan chickens' intestine on the menu. Some of my favourite Irish foods are the simplest: fresh oysters from the Temple Bar market, freshly baked soda bread from Avoca, or a well-looked after Cashel Blue cheese (from a cheesemonger, not the unripe stuff you can get in supermarkets). Dublin coddle - though I've only encountered this once, and, to be fair, most of my Irish friends have never heard of it so wouldn't be pressing it on anybody. The specimen I was served consisted of a watery stew of potatoes, onions and boiled, flabby white cocktail sausages. I'm sure it could be fine with good ingredients, but I'm not planning to test it again. What are the food oddities in Ireland? Other than the coddle, I haven't encountered anything that made my hair stand on end. A good Irish fry will often include both black and white pudding (blood and liver sausages, respectively), which do horrify some visitors, though I love both if they're well made. A friend of mine had a seaweed flan while visiting the west coast, but I haven't seen this anywhere else, unfortunately. 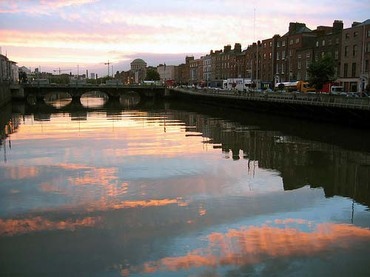 Which cuisine features most strongly in Dublin? Going to the pub is, all clichés aside, a national pastime - and one I've taken up with great pleasure. Many pubs in Dublin are brilliant places to spend an hour or two chatting, and as this often leads up to dinner time, there's an awful lot of pub food consumed. Pubs (because Guinness is eating and drinking): I like traditional pubs, and my favourites in the city are the Stag's Head, the Long Hall, Neary's and Mulligans. All pull an excellent pint, although Mulligans is the best for Guinness by far. For when you want to sink back into a comfortable chair and have a peaceful (though not sepulchral) drink, the Library Bar upstairs at the Central Hotel is your natural port of call. And the Market Bar is a great modern space, a renovated warehouse lit by skylights, serving tapas throughout the day. BUDGET: It can be hard to get a really cheap meal in the city, short of grabbing a baguette at a Centra. One inexpensive option is to pick up a square of pizza at the Steps of Rome - it's often delicious and costs less than a fiver. If you're willing to spend a bit more you can get some great food for €7 - 15: try the Market Bar for tapas, Cornucopia for heaping plates of tasty vegetarian food, Zaytoon for good-quality kebabs, and the café upstairs at Avoca for well-cooked café staples. 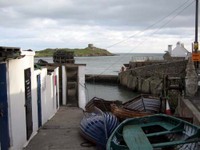 AFFORDABLE: This category opens up a huge swathe of possibilities in Dublin. A few suggestions: L'Gueuleton is a great French bistro, serving everything from delicious and filling €5 soups to €20-plus meat dishes. They don't take bookings so get there early or be prepared to wait. Yamamori does very good noodle soups, sushi and bento boxes. New Millenium and Good World are both excellent for dim sum, while Salamanca does great tapas and Spanish food. The Mermaid Café is my favourite for weekend brunch. The best fish restaurant I've been to in Dublin is Caviston's - I had a plate of grilled fresh sardines that shut me up with pleasure for at least 10 minutes. It's outside the city centre, but easily reached by city train and close to the bay if you feel tempted to walk off lunch. Even further afield, if you have a car and are visiting the Wicklow mountains on the southern edge of Dublin, it's well worth stopping off at the Roundwood Inn for their Irish-German cooking, including excellent choucroute. Finally, if you happen to be touring the country, then do yourself an enormous favour and stop in at Café Paradiso in Cork. Eating there has been one of my favourite dining experiences in the last few years. It's seasonal vegetarian cooking, done so brilliantly and with such imagination you'll wish you lived next door and could eat there again and again. BREAK THE BANK: I have to admit that I haven't really explored many of Dublin's most expensive restaurants. I've eaten at l'Ecrivain and enjoyed it immensely - their use of Irish produce is inspiring, their duck is rightfully famous, and the atmosphere is very friendly. Friends with good taste (and deep pockets) have also recommended Chapter One, Patrick Guilbaud and One Pico. When I first arrived in Dublin, I found myself avoiding the not-very-inspiring supermarkets and instead constructing meals with ingredients bought in half a dozen different shops. That's a very pleasant way to shop and cook if you've got the time, and there are some extraordinarily good specialist food shops here, but it can mean that you spend an hour a day foraging around central Dublin to put dinner together. The pick of the bunch in town are Sheridan's Cheesemongers for an excellent range of well-affinaged Irish and continental cheeses, and La Maison des Gourmets for superb French-style bread. People rate Sawyers as a good fishmonger and I've had fairly good luck there, although I prefer Beshoffs or Wrights, both in Howth. The market also holds an excellent fishmonger, who often has very fresh and tasty scallops; small stalls from Sheridan's and Corleggy cheeses, la Maison des Gourmets and other bakeries; a couple of well-stocked organic vegetable stands, a good butcher, and a number of stalls selling prepared food. Finally, although I said that daily shopping in Dublin required stopping off at loads of different shops, that's recently become less true than it used to be. Fallon and Byrne, a fairly fancy food hall, has recently opened with the stated aim of being a one-stop shop for good groceries. To a large extent it succeeds: they have a good cheese and charcuterie counter, a meat and fish counter, a wide range of fresh produce, and a strange but very enjoyable middle section combining well-priced essentials like jars of tuna and cans of chickpeas with obscure and outrageously expensive condiments, chocolates and so on. You could definitely put together a top-class picnic lunch, a Monday-night supper or a three-course dinner there. You can also drop a lot of money there very easily - god knows I have. The centre of Dublin is packed with restaurants. The streets between Grafton St and South Great Georges St are particularly flourishing, with about every third shop being a café, restaurant or pub. On the north side of the river, there's a small Italian quarter around Bloom's Lane (just north of the Millenium Bridge), and very cheap but sometimes really great Asian restaurants along Moore St (off Henry St) and Parnell St.
What’s the biggest flop in terms of food and best avoided? The only suggestion I'd have here is to avoid Temple Bar unless you've got a trustworthy recommendation. It's full of stag and hen parties most nights of the week, and a lot of the restaurants there cater to that transient crowd, with so-so food at high prices. There are exceptions, of course - I loved Ho Sen Vietnamese restaurant, for example, and some of the cafés are good. I think most professional online guides tend to err on the side of generosity - I've seen loads of fairly bad restaurants given sterling reviews! If you're picking a restaurant out of the blue, you could try one of the "Dublin's best restaurant" lists, like this one. Otherwise, I do often agree with Georgina Campbell's reviews. What to be aware of when dining out in Dublin? Tipping is expected, and I usually give between 10 and 15 % depending on the service. Smoking is prohibited in all public spaces, including pubs, cafes and restaurants, which makes going out for a drink or a meal a pleasure for those of us who don't smoke. If you're dining out on a Thursday, Friday or Saturday night, it's always wise to book. I often end up eating in town with friends on Friday evening without pre-planning anything, and while we've never starved, there have been a few occasions where we've trekked from restaurant to restaurant being turned away with tales of hour-long waits for a table, before finding a place that could take us. The information and photography were kindly provided by and published with permission of Meg of Though small, it is tasty. If you have culinary information about your city to share, do drop me a line. And of course there's something in it for you!!! For addresses, read continuation of post. Great post - well done. I really like informative posts like this. The only restaurant I know that's not in your list is Thornton's at The Fitzwilliam Hotel which has been Michelin starred for many years, I believe. I just checked it on the web and it seems to be closed for refurbishment, but this hasn't caused it to lose its star in the 2007 Guide Rouge. I really enjoy your blog. I like coming and learning in a snap about different culinary places around the world. "boiled bacon and cabbage..... Those dishes are still to be had in every pub". Yes, fair enough Tony - I rarely saw that particular dish in pubs. I meant that "substantial winter food" was available in loads of pubs but should have been clearer. Apologies (very belated). Coddle is absolutely beautiful if made by the right person. Got to be eaten on horrible winter nights before heading out. Growing up in Dublin I used to really look forward to it. Still do !